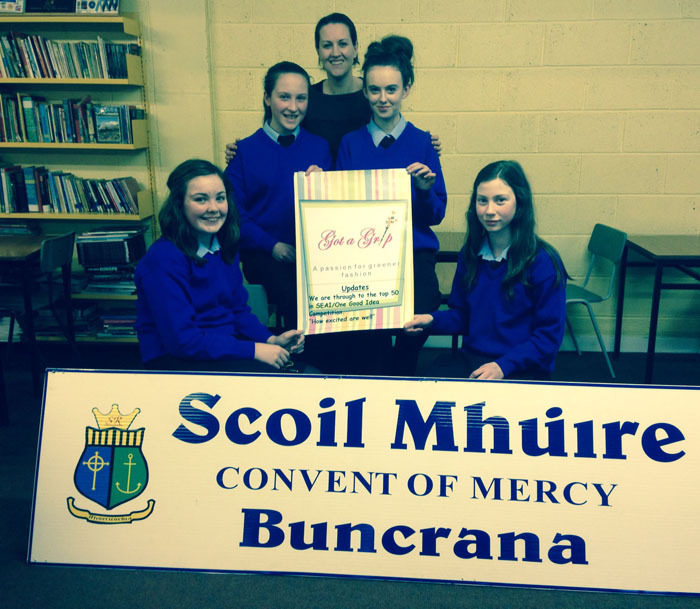 A group of four Scoil Mhuire students are getting to grips with green fashion as they take part in a national ‘One Good Idea’ competition. Four first year students – Aisling Callaghan, Eva Friel, Cara McGonagle and Amy McDermott – have progressed to the final 50 teams in the Sustainable Energy Authority of Ireland sponsored ‘One Good Idea’ competition. And they’re hoping to advance to the national finals, which will be held in Dublin’s Mansion House in May. Together, the students have developed ‘Got a Grip: gripping fashion’ a green-friendly fashion accessory kit based on used hair grips that are plentiful in most homes. The kits feature hair grips and fabrics and include instructions on how to make your own accessory. “Our two main themes are hair and jewellery, including ear-rings, necklaces and brooches,” team member Eva Friel said.